This issue seems to get beaten to death but since I switched back to IDEA from Eclipse recently it was something I revisited(1). While on Eclipse I had just used Courier New but I’ve never really been totally sold on it. In general I don’t like serif fonts for coding. The serifs seem to take away from on-screen readability. But I never really liked any of the sans-serif monospace fonts available either. Lucida doesn’t look good to me…something about the spacing bothers me. Fonts are one of those purely subjective things, though. I have tried some of the bit mapped fonts that I’ve seen listed by other people in the past as well but since I run at relatively high resolutions they don’t ever work well. I really needed a scalable font. Enter Consolas. Consolas is this new monospaced font from Microsoft that is standard on Vista and available for those that have Microsoft Visual Studio. The installer won’t actually even let you install it unless you meet those constraints. But luckily you can install the free version of Visual Studio, install the fonts, and then remove it. 🙂 And then you can save the font files off by themselves for future use. 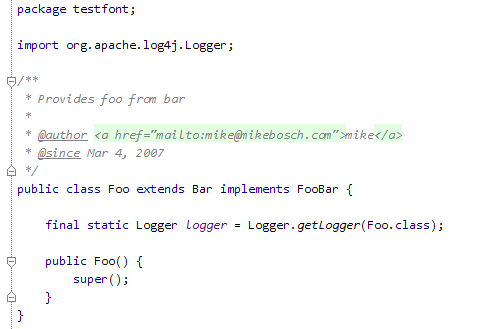 Here’s an example of the font on IDEA with font anti-aliasing turned on, running under Java 6. Even running under Java 6 you still need to turn on font anti-aliasing to get it to look similar to Eclipse. I’m hoping the next version of IDEA that officially supports Java 6 will be able to use the platform anti-aliasing that comes built-in. I’d be interested to hear if anyone else has switched to this font or if they’ve tried it. This is my favorite so far and I’m really happy with it. It’s funny sometimes how something that would seem so insignificant as a font can change your productivity. Well, I should say that a bad font can really screw with my concentration at times…I’ve had enough experience with typesetting/publishing in the past that crappy fonts bother me a lot. (1) Switching was not really my choice. My new group uses IDEA while my previous one used Eclipse. They’re both good IDEs. This isn’t really a post about the merits of each IDE. You can download it but when I first tried to install it, the installer stopped after telling me I needed Visual Studio to proceed. Maybe that’s changed since then…not sure.